The southern U.S. city of New Orleans, devastated by Hurricane Katrina 10 years ago, is seeing back-to-back-to-back visits by U.S. presidents: current President Barack Obama on Thursday, former President George W. Bush on Friday and former President Bill Clinton on Saturday. Bush held the office in 2005 when Hurricane Katrina's floodwaters broke through protective levies, killing 1,800 people and destroying 100,000 homes. He addresses a crowd on Friday at Warren Easton High School, where he spoke on the storm's first anniversary. 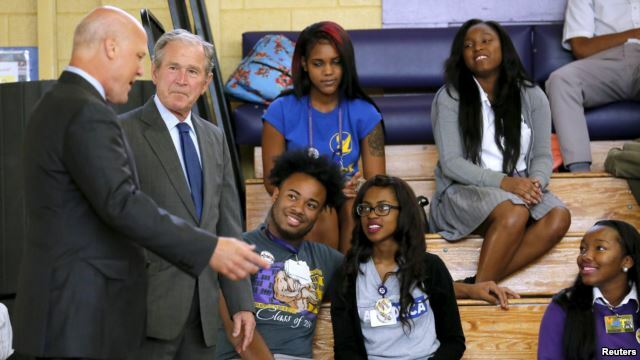 He is also scheduled to speak at an education roundtable on efforts to rebuild New Orleans' schools. 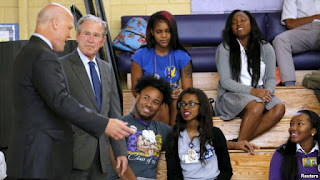 The Bush administration was roundly criticized in the days following Katrina for a slow emergency response to the thousands of people needing shelter, supplies and security amid the flooding. 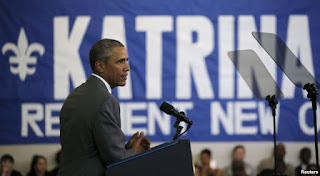 On Saturday, Clinton is scheduled to appear at a ceremony marking the anniversary of Katrina's landfall in New Orleans. The ceremony will also feature Mayor Mitch Landrieu and local cultural and religious leaders. On Thursday, Obama hailed the southern U.S. city’s revival. "You are an example of what is possible when, in the face of tragedy and in the face of hardship, good people come together to lend a hand," he told hundreds of residents gathered at a new community center in the Lower Ninth Ward, which was devastated by the storm. "And brick by brick, block by block, neighborhood by neighborhood, you build a better future." The president highlighted New Orleans’ recovery and “remarkable progress” after suffering massive flooding. "The project of rebuilding here wasn't simply to restore the city as it had been, it was to build a city as it should be," he told the crowd of 600. "A city where everyone, no matter who they are or what they look like or how much money they've got, has an opportunity to make it." The president opened his remarks by noting the fast, steady and strong recovery of the U.S. economy. Obama said despite weeks of volatility in global stock markets, "the United States of America, for all the challenges we still have, we continue to have the best cards — we just have to play them right." The storm that slammed into New Orleans on August 29, 2005, broke through protective levies and left more than 80 percent of the city under water. Torrential rains and winds up to 280 kilometers an hour raked the city near the Gulf of Mexico. "The world watched in horror as we saw those rising waters drown the iconic streets of New Orleans, families stranded on rooftops, bodies on the streets, children crying, crowded in the Super Dome,". Obama said. 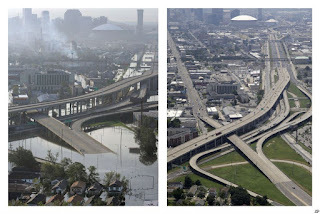 Katrina caused more than $135 billion in damage, making it the costliest natural disaster ever in the United States. "What started out as a natural disaster became a man-made disaster, a failure of government to look out for its own citizens," the president noted. Much of the U.S. Gulf Coast was heavily damaged by the storm, resulting in billions of dollars in federal assistance spent to help coastal communities rebuild. Obama, on his 10th visit to the coastal city, called New Orleans’ recovery a model for the nation in urban innovation and disaster response and resilience. More than $14 billion has been spent to reinforce levees. The president also noted the importance of making communities more resilient to natural disasters. "We are going to see more extreme weather events as the result of climate change, deeper droughts, deadlier wildfires, stronger storms," he said. "That’s why, in in addition to things like new and better levies, we have also been investing in restoring wetlands and other natural systems that are just as critical for storm protection." 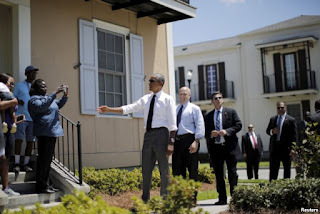 Prior to his speech Thursday, Obama and New Orleans Mayor Landrieu walked through the historic African-American neighborhood of Treme, home to jazz legends. Treme was flooded during Katrina, with many areas submerged by several meters of water. Many residents fled after the storm and never came back. Others have moved into new mixed-income housing constructed on the sites of former public housing projects. On a stroll Thursday, Obama met with several residents who waited outside their newly constructed homes. He later spoke to reporters about the community’s revitalization. "Part of our goal has always been to make sure not just that we recover from this storm, but also that we start dealing with some of the structural inequities that existed long before the storm happened." Obama pointed out that just because the residents have nice housing does not mean the job is done. He noted the need to combat poverty, income inequality and a lack of affordable housing, particularly in the African-American community.